02/08/2018: OhioFirst.Net Next Generation Command Virtual Reality Experience! We are proud to announce that a virtual reality experience for the OhioFirst.Net Next Generation Command suite is now available. Experience the life-saving potential of enhanced situational awareness--now in virtual reality. Get it at ohiofirst.net/game!. Location is to be determined in or around downtown Columbus. 11/30/2017: Ohio opts in to FirstNet! Ohio has opted in to FirstNet's plan for implementation of the Nationwide Public Safety Broadband network, making us the 33rd state to opt in! More information about FirstNet's service is available at https://firstnet.gov. Dedicated public safety broadband is not just coming, it’s already here—and it’s in Ohio today. This video tells the story about a series of exciting projects where we deployed dedicated band 14 cellular networks for real-world events and exercises including multiple OSU football games and a three-day exercise in Beavercreek Township. Ohio performed a comprehensive, county-by-county coverage review process from October 2015 to September 2016 to determine Ohio stakeholder needs from FirstNet. Explore our findings via our interactive map! 5/22/2016 Next Generation Firefighter Video Game Available! Find out more and download now! 5/2/2016: Sign up for Our LTE Pilots! We are excited to invite public safety stakeholders to sign up for our Public Safety LTE Demo in Beavercreek, Ohio! Click below for more information and to sign up to participate in this exciting event. 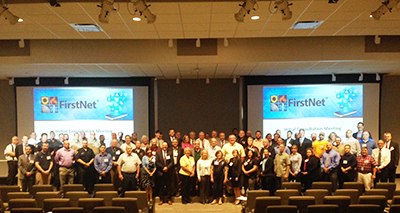 Thank you for all who attended our initial consultation meeting with FirstNet last week! Find all presentation slides and meeting minutes here. This short, 6-minute training video explains what FirstNet means for the state of Ohio, including opting in versus opting out and the consultation process. Watch it here! FirstNet highlighted our initial consultation meeting, and in particular, our excellent use cases presented at the meeting. Read more here! We are proud to announce the first in our NPSBN video training series, "What is 'Broadband'?"! This module provides a common-sense, non-technical presentation of the term "broadband". Watch it here! We have added a reference library full of helpful content to help you learn more about FirstNet and the OhioFirst.Net program! Check it out here! 3/10/2015: FAQs and Acronyms pages! We have added Frequently Asked Questions (FAQ) and Acronyms pages. If you have a question that isn't answered on these pages, or an acronym you don't see on our list, please contact Kelly Castle at kelly.castle@das.ohio.gov! 2/17/2015: OFIP POC Survey Released! Today, we launched the OhioFirst.Net Implementation Project Point-of-Contact Survey. This is the first of two surveys to assess user requirements throughout the state. This invite-only survey was sent to over 3000 public safety and support organizations throughout the state. If you are a responsible for communications for an Ohio public safety agency, take the survey here: http://firstnet.ohio.gov/POC-Survey. We are proud to announce that we have published our first newsletter! We will be issuing newsletters no less than quarterly to keep stakeholders educated about our program. Our mission is to ensure successful deployment of a mission-critical cellular network for public safety in Ohio. This network is called the Nationwide Public Safety Broadband Network and is separate from commercial cellular networks used by consumers. We will reach our goal through outreach and education about the potential for public safety broadband, business case development, executing the consultation process with FirstNet, and leveraging public/private partnerships to support the network.